Republican presidential candidate Mike Huckabee says talk among some conservative Christians to back a third-party candidate if the GOP nominates someone who supports abortion rights suggests that front-runners aren't connecting with the party's base. "I think it says about the media-anointed front-runners that there's some dissatisfaction...That's why I'm in the race," Huckabee told reporters before a private fundraiser Tuesday. "If you look at some of the people who maybe have a lot of money but their ideas don't resonate with the Republican base voters, so it's not surprising." Huckabee, a Southern Baptist minister, noted his opposition to abortion and said he doesn't think it's necessary for Christian evangelicals to threaten leaving the party. More than 40 Christian conservatives attended a meeting Saturday in Salt Lake City to discuss the possibility of supporting a third-party candidate. "I don't think it's necessary at all to be thinking about a third party. I think it's necessary to think about the people who have been out there on the track," Huckabee said. "The fact that a few people talk about a third party doesn't mean they're the rank and file. There's a lot of people who are quite satisfied with my candidacy within that group of evangelical and social conservatives." Huckabee returned to Texarkana, where he launched his political career 15 years ago, for a fundraiser at the home of former state Rep. David Haak. Huckabee was a pastor at Beech Street Baptist Church here when he launched his unsuccessful campaign for the U.S. Senate. He later became lieutenant governor of Arkansas and then governor, completing more than 10 years in that office in January. "This is where it all started for me politically," Huckabee said. "It was the people of Texarkana who really gave me that launch. Whatever political roots there are for me are right here in Texarkana." Huckabee's campaign did not say how much it expected to raise from the $1,000-a-person fundraiser, but Haak estimated that about 90 people would attend. Huckabee has trailed the frontrunner candidates in fundraising and did not say how much his campaign has raised in the third quarter, which ended Sunday. "We've never had to raise the kind of money other candidates have had to raise because our expenditures are much more frugal. 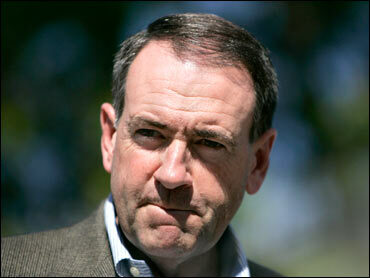 What we're going to have is enough money to stay out there," Huckabee said. According to his last campaign finance report, Huckabee raised $1.3 million in the first six months of the year, a fraction of the $33.5 million Rudy Giuliani and the $35 million Mitt Romney reported in contributions during the same period. Haak's home filled with friends and members of the church where Huckabee served as pastor for several years. "This is as much like home as anyplace else he's lived," said Danny Gray, a Texarkana jewelry store owner and former mayor who has known Huckabee since 1986. "He did so much for this community. I think it's appropriate for him to come back here now." Prissy Hickerson, a former highway commissioner and close friend of Huckabee's, said the former governor's small presidential campaign reminded her of the financially strapped bid he launched in his run against then-Sen. Dale Bumpers in 1992. "When he ran, the people of Texarkana were his organization," Hickerson said. "We had people come in from Hope and Magnolia to help fold and stuff envelopes, but the core was really here." Despite stumping in a city sitting on the Texas border, Huckabee said he'll maintain his home roots when the Arkansas Razorbacks play the Texas Longhorns in 2008. "Even the Texans will expect that I'll go 'woo, pig, sooie' when the Hogs play the Longhorns. The Texas people will forgive me and, in fact, the Aggie fans, and the Baylor and (Texas) Tech fans will applaud me for it," Huckabee said.